Background Gastro-oesophageal reflux is prevalent in preterm infants. Despite widespread use in clinical practice, there is still much controversy over the efficacy and safety of drug interventions, particularly antacid therapy. 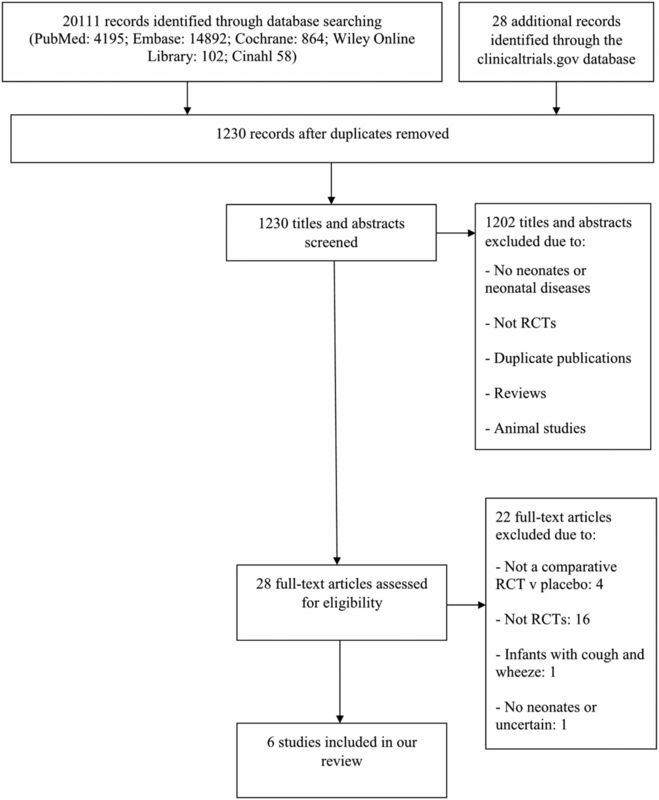 Objective To systematically review the effects of antacid therapy on preterm infants with symptoms of gastro-oesophageal reflux, and to assess the safety of these interventions. Methods We carried out an electronic search of the Cochrane central register of controlled trials (CENTRAL, The Cochrane Library), MEDLINE (1966–present), EMBASE (1980–present) and CINAHL (1982–present) as well as other online sources. Participants were preterm infants (<37 weeks gestation) with gastro-oesophageal reflux disease who were receiving care on a neonatal unit. We assessed the effects of histamine-2 receptor antagonists, proton pump inhibitors and alginates against placebo, primarily to see if they reduced the symptoms of reflux. Results Six studies were included in this review. Meta-analysis could not be carried out due to a lack of studies assessing the same intervention with the same outcomes. Omeprazole therapy significantly reduced the oesophageal acid exposure percentage time with pH<4 (p<0.01) and sodium alginate significantly decreased gastro-oesophageal reflux episodes (p=0.024). Metoclopramide and ranitidine showed a significant increase in gastro-oesophageal reflux disease symptoms versus placebo (p<0.04). No significant results were found for the use of esomeprazole or lansoprazole versus placebo. Conclusions There is insufficient evidence available to conclude whether antacid therapy is effective or safe when treating gastro-oesophageal reflux disease in preterm infants. Further research is needed into this topic and caution should be taken when administering antacids to preterm infants. This is an open access article distributed in accordance with the Creative Commons Attribution Non Commercial (CC BY-NC 4.0) license, which permits others to distribute, remix, adapt, build upon this work non-commercially, and license their derivative works on different terms, provided the original work is properly cited, appropriate credit is given, any changes made indicated, and the use is non-commercial. See:©http://creativecommons.org/licenses/by-nc/4.0/. Gastro-oesophageal reflux is a prominent condition among preterm infants. Antacids are often used to treat gastro-oesophageal reflux disease (GORD), despite the lack of good quality evidence to support its use. Studies have shown a significant positive correlation between the use of histamine-2 receptor antagonists and important complications. There is limited evidence supporting the use of antacids in preterm infants. Omeprazole reduced gastric and oesophageal pH, but did not alter GORD symptoms. Esomeprazole and lansoprazole had no significant effect on GORD signs and symptoms. Combined use of ranitidine and metoclopramide appears countereffective, with placebo periods giving less bradycardia episodes versus drug periods. Gastro-oesophageal reflux (GOR) is a prominent condition among preterm infants. Symptoms such as apnoeas, desaturation, bradycardia, vomiting, poor weight gain and irritability have been attributable to GOR, which is called gastro-oesophageal reflux disease (GORD), when symptoms are severe. GORD has been reported to cause irritability, frequent vomiting, apnoea and bradycardia, aspiration pneumonia, aversion to feeding and exacerbation of chronic lung disease in term and preterm infants with associated resource implications from longer hospital stays. There continues to be a widespread use of antacid therapy in neonatal units today despite the evidence gaps. This review was carried out to systematically evaluate the evidence of efficacy and safety of antacid treatment for GORD in preterm infants and to highlight potential areas for future research. To assess the efficacy of antacid therapy in preterm infants diagnosed with GORD. To assess the safety of antacid therapy in preterm infants diagnosed with GORD. We used Preferred Reporting Items for Systematic Reviews and Meta-analyses guidelines and the Cochrane Handbook of Systematic Reviews of Interventions approach for conducting and reporting systematic reviews and meta-analyses of randomised controlled trials (RCTs).5 6 The methodology of this systematic review was published in PROSPERO (www.crd.york.ac.uk/PROSPERO; ref CRD42017078778). MEDLINE/PubMed, Embase, Wiley Online Library, Cochrane Library and Web of Science databases were searched to identify trials of antacid therapy in preterm infants. Databases were screened for publications from the earliest available date until 15 October 2017. No language restrictions were applied. Ethical approval was not required because only published articles were included in this review. A database search of clinicaltrials.gov for ongoing and completed trials was also carried out, using the search terms infant or preterm and reflux or gastroesophageal reflux. Trials reported as abstracts or letters to the editor were included if sufficient data to fulfil the inclusion criteria were presented within the report, or provided by authors. Full search strategy is presented in online supplementary appendix 1. All relevant randomised trials involving preterm infants (<37 weeks gestation) with GORD (clinical diagnosis and/or 24 hours intraoesophageal pH monitoring, or impedance studies) receiving care on a neonatal unit. Crossover, randomised trials or quasi-randomised studies, described in some way as to suggest or imply that the study was randomised if the demographic detail of each group was similar were included. We included all available RCTs evaluating antacid therapies for GOR in preterm neonates. Antacid therapy (administered by any method) should have been commenced after the diagnosis of GORD and continued for any duration. H2 RAs versus a placebo or standard care/non-pharmacological therapy. PPIs versus a placebo or standard care/non-pharmacological therapy. Alginates versus a placebo or standard care/non-pharmacological therapy. Trials were not limited by dose, frequency or duration of intervention. Paired reviewers (ED, CM, BS, JD) independently screened titles, abstracts and then full texts for eligibility, assessed risk of bias and collected data from included studies. Any disagreement between reviewers was resolved through discussion or adjudication by a third reviewer (BS, JD). In case of duplicate publications, the most recent and updated report of the study was included. From each eligible study the following information was collected: study characteristics (eg, author name, year of publication, sample size, patient characteristics, antacid type, duration of intervention, dosage and any of our preplanned clinical outcomes). A reduction in reflux symptoms assessed by a reflux index score or bedside symptom charts.9 Clinical symptoms include the following: total GOR episodes, vomit/regurgitations, choking/coughing, bradycardia attributed to GOR, behavioural/crying, feeding difficulties, irritability or pain, recurrent postprandial apnoeas and oxygen desaturation within 2 hours postprandial period. We planned to analyse treatment effects in the individual trials using Review Manager 5.3 software, with risk ratio and risk difference for dichotomous data and mean difference for continuous data, with respective 95% CIs. However, given the small number of included studies, their varying methodologies and interventions, we judged quantitative meta-analysis to be inappropriate and instead report a narrative description of each study. Data are presented as reported in individual studies. We had also planned to conduct a number of subgroup analyses, which are detailed in the study protocol. The small number of studies, with small sample sizes and variable methods precluded subgroup analyses. A total of 20 139 records were identified by the initial search; 18 909 were excluded as they were duplicates, or systematic reviews; 1230 titles and abstracts were screened and 1202 were excluded. Twenty-eight full-text articles were assessed for eligibility and six studies met our inclusion criteria (figure 1). Study flow diagram. RCT, randomised controlled trial. All included studies were double-blind, randomised, placebo-controlled trials. Four of the six were crossover trials (Wheatley and Kennedy,10 Omari et al,11 Corvaglia et al,12 Corvaglia et al 13), while the remaining two were parallel trials (Orenstein et al 14 and Davidson et al 15). The main characteristics of included RCTs are described in table 1 and excluded studies are summarised in online supplementary appendix 2. Risks of bias assessments of trials are summarised in figure 2 and online supplementary appendix 3. The evaluations of the level of evidence of outcomes according to the GRADE approach are summarised in online supplementary appendix 4. A total of 302 participants were enrolled in the six included trials, of which, four studies included only preterm infants. Omari et al 11 included preterm infants between 34 and 40 weeks gestational age, Corvaglia et al 12 and Corvaglia et al 13 included ≤33 weeks gestational age and Wheatley and Kennedy10 included those with a gestational age of <37 weeks at birth and a corrected gestational age at enrolment of <44 weeks. Orenstein et al 14 and Davidson et al 15 included both preterm infants and full-term infants. The inclusion criteria for each study defined GORD differently (table 1). Primary outcome: all six studies assessed various reflux symptoms. Four trials reported GOR episodes based on 24-hour pH/impedance monitoring.11–13 15 Three trials reported bradycardia (Davidson et al,15 Omari et al,11 Wheatley and Kennedy10) and three trials reported apnoea (Corvaglia et al,13 Davidson et al,15 Omari et al 11). The other reported outcomes included vomiting, apnoea, bradycardia, oxygen desaturation, gagging, back arching and irritability/crying/fussing.10 11 14 15 None of the studies reported on the prespecified secondary outcomes, namely: time taken to establish full enteral feeds, length of hospital stay, NEC and suspected or proven sepsis. Orenstein et al looked at treatment-emergent adverse events (AEs) and serious adverse events (SAEs) including upper respiratory tract infections, constipation, dermatitis, ear infections, fever, lower respiratory tract infection, respiratory tract congestion, rhinorrhoea, candidiasis, diarrhoea (excluding infective), vomiting, alkaline phosphatase increase and others. Thirty-two patients with a median gestational age of 30 weeks were enrolled in Corvaglia et al.12 Participants were fed eight times over a 24 hours period, with meals alternatively given with drug (‘drug-given’ (DG)) and without drug (‘drug-free’ (DF)). Twenty-eight patients with a median gestational age of 30 weeks were enrolled in Corvaglia et al.13 Participants were studied between the hours of 09:00 and 18:00, when they were recorded twice, for 3 hours each time, after one DG meal and one DF meal, the order of which was randomly chosen. All other outcomes were not significant (liquid GORs, mixed GORs, non-acid GOR episodes detected by multichannel intraluminal impedance monitoring, non-acid MII-GOR-bolus exposure index and distal GORs).12 No differences in the number of total apnoea episodes, central apnoeas, obstructive apnoeas, mixed apnoeas, desaturations, bradycardia, pathological apnoeas were found between DG and DF periods (p value was not significant)13 (table 2). No significant results were obtained from this study, which was discontinued prematurely due to poor enrolment15 (table 3). Ten preterm infants with a mean postmenstrual age of 36.1±0.7 weeks and mean postnatal age of 50±9 days were enrolled in the study by Omari et al.11 Participants were given omeprazole for 7 days and placebo for 7 days in randomised order. At the end of each week of interventions, a 24-hour oesophageal and gastric pH monitoring study was performed. Analyses on the basis of pH recordings showed that omeprazole therapy significantly reduced the oesophageal acid exposure % time pH<4 and reduced gastric acidity % time pH<411 (table 3). There were no significant changes to symptom frequency (vomiting, apnoea, bradycardia, choking, behavioural changes) or blood results. One hundred sixty-two patients were enrolled in the study by Orenstein et al, 44 of whom were premature infants, with a median gestational age at birth of 35 (IQR 25–39) weeks.13 Participants were randomly selected to take either lansoprazole (n=81) or a placebo (n=81) for up to 4 weeks. There was a 35% loss of follow-up for participants receiving lansoprazole and 36% for participants receiving placebo. Lansoprazole and placebo produced identical responder numbers (54%). Responder status was defined as a ≥50% reduction from baseline in either percentage of feedings with crying episode(s) or duration (in minutes) of episodes averaged across feedings. No significant results were obtained from this trial. SAEs, particularly lower respiratory tract infections, occurred more frequently with lansoprazole than with placebo group (10 vs 2; p=0.032) (table 3). Sodium alginate significantly reduced acid GOR episodes, although had no effect on the reduction of apnoeas. Corvaglia et al 12 reports that participants were observed over a 24-hour period, and data were collected after eight meals. There may have been selective reporting in the study by Corvaglia et al,13 with authors only reporting data from a 6-hour period of observation instead of the full 24 hours data, thus presenting more significant results. This discrepancy diminishes the validity of the reports and applicability to clinical practice. A number of limitations are worth noting, not all studies met the inclusion criteria outlined in the methods. We initially stated that only preterm infants<37 weeks gestation were to be included in this review; however, both Davidson et al and Orenstein et al included data for full-term infants as well as preterm, some of whom were >37 weeks gestation. The authors were contacted to obtain exclusively preterm data, however, replies were not received. We included these studies in this review due to the high percentage of preterm infants enrolled in the trials. The methods stated that the only interventions that were to be considered were H2 RAs, PPIs and alginates; however, Wheatley and Kennedy assessed the combined effects of both metoclopramide (dopamine receptor antagonist) and ranitidine (H2 RA).10 We still decided to report this outcome as the inclusion of the H2 RA as it is of interest to the reader in general who must bear in mind this was a combined intervention. Studies included in the review were heterogeneous in terms of design, study characteristics such as age of participants and interventions considered for the treatment of GORD. Studies also had small sample sizes. This limits the conclusions that can be drawn from this review; however, it highlights the gaps in the evidence. To our knowledge, this review is the first to look into the effects of antacids in preterm infants. There is insufficient evidence on the efficacy and safety of antacids in preterm infants. The lack of research in this area of medicine is a problem that must be addressed in this population of patients. Adequately powered, RCTs in preterm infants are needed to determine the safety and efficacy of these commonly used medications.
. Pharmacokinetic interaction study between ranitidine and metoclopramide. Rom J Gastroenterol 2004;13:211–4.
. Pharmacological treatment of children with gastrooesophageal reflux (Review). Cochrane Database Syst Rev 2014;11:CD008550. Contributors ED had full access to all study data and takes responsibility for the integrity and accuracy of the data. Study concept and design: JD and BD conceived and designed the study. Acquisition of data: CM and ED. Analysis and interpretation of data: ED, CM, PK, BD and JD. Drafting of the manuscript: ED, PK and JD. Critical revision of the manuscript for important intellectual content: JD. All authors approved the final manuscript as submitted and agree to be accountable for all aspects of the work. Funding This research received no specific grant from any funding agency in thepublic, commercial or not-for-profit sectors. © Author(s) (or their employer(s)) 2018. Re-use permitted under CC BY-NC. No commercial re-use. See rights and permissions. Published by BMJ. This is an open access article distributed in accordance with the Creative Commons Attribution Non Commercial (CC BY-NC 4.0) license, which permits others to distribute, remix, adapt, build upon this work non-commercially, and license their derivative works on different terms, provided the original work is properly cited, appropriate credit is given, any changes made indicated, and the use is non-commercial. See:©http://creativecommons.org/licenses/by-nc/4.0/.